Bernard Meninsky (1891-1950) was born in Karotopin, Ukraine. He was brought up in Liverpool, where he attended School of Art in 1906. He studied briefly at Royal College of Art and Academie Julian, Paris. With a scholarship, Meninsky entered the Slade School of Fine Art in 1912-13. In 1919 held his first solo show at Goupil Gallery. 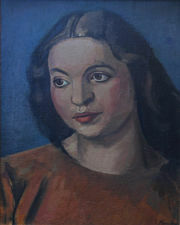 Meninsky showed with London Group and NEAC. He illustrated Minton's poems L'Allegro and Il Penseroso published in 1946. Arts Council put on a memorial exhibition in 1951-52 and retrospective show took place at Adams Gallery in 1958. Further solo shows took place in other major British art galleries. His work is represented in Tate Gallery, Brirtish Museum, Victoria and Albert Museum, Imperial War Museum, Arts Council, National Gallery of Ireland, the galleries of Hull, Leeds, Liverpool, Manchester, Nottingham, Sheffield and many others. Bibliography: John Russell Taylor 'Bernard Meninsky' published by Redcliffe Press 1999.